British scientists recently reported finding signs of the gum-disease bacterium (P. gingivalis) in the brains of Alzheimer’s patients. The new study is being widely reported as adding to a growing body of evidence linking periodontal (gum) disease to an increased risk for Alzheimer’s disease. However, such data needs to be considered very carefully. In fact, what the study found was that substances on the surface of the bacterium (lipopolysaccharides) were present in the brain tissue of four out of 10 recently deceased people who had Alzheimer’s. It was found in zero out of 10 age-matched patients who did not have Alzheimer’s. The bacteria itself was not found in the brain tissue of any people. The theory behind linking gum disease with Alzheimer’s is that the presence of gum bacteria lipopolysaccharides in the brain may cause inflammation. This in turn could trigger a biological cascade that may be linked to the brain changes associated with Alzheimer’s disease. We already know that P. gingivalis is commonly found in chronic periodontal (gum) disease, and, if there is significant dental disease, it can enter the bloodstream through such everyday activities as eating, brushing teeth and invasive dental treatments. While in the bloodstream, the bacteria can settle on heart valves and damage them. Hence, patients with mitral valve prolapse and other heart anomalies often take an antibiotic before dental procedures to prevent the bacteria from depositing within the heart. However, no bacteria have been reported in the brains of patients with gum disease, as the brain is an immunologically, well-protected organ, more so than any other. Brain atrophy involves the loss of neurons. Some degree of atrophy and subsequent brain shrinkage is common with old age, even in people who are cognitively healthy. However, this atrophy is accelerated in people with mild cognitive impairment and even faster in those who ultimately progress from mild cognitive impairment to Alzheimer’s disease. Many factors have been implicated in affecting the rate of brain atrophy, one of which is high levels of an amino acid in the blood called homocysteine. Studies have shown that raised levels of homocysteine increase the risk of Alzheimer’s disease. In a recent randomised controlled trial, researchers investigated the role of vitamin B in regulating levels of homocysteine. They specifically wanted to test whether lowering homocysteine through giving high doses of vitamin B for two years could reduce the rate of brain atrophy in people with pre-existing mild cognitive impairment. Volunteers aged 70 and older with concerns about their memory were recruited for this study. It was specified that volunteers should have a diagnosis of mild cognitive impairment (MCI), defined using specific criteria. These included a concern about memory that did not interfere with activities of daily living and pre-specified scores on some cognitive scales assessing word recall and fluency. The study excluded people with a diagnosis of dementia, who were taking anti-dementia drugs or who had active cancer. 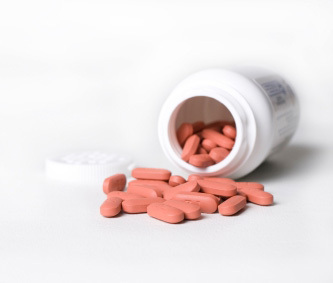 People taking folic acid and vitamin B6 or B12 above certain doses were also excluded. Every six months, the volunteers were randomly assigned to receive either high-dose oral vitamin B tablets (0.8 mg folic acid, 0.5 mg vitamin B12 and 20 mg vitamin B6) or placebo pills during the two-year period. The participants, their partners and all staff directly involved in the study were unaware which pills participants were taking. The double blind nature of the study was important as it eliminated potential biases associated with the patients’ or researchers’ knowledge of which treatment was being received. MRI scans were performed at the start of the study and again after two years. The researchers used these scans to calculate the rate of brain atrophy each year. A total of 271 people were randomly assigned a treatment, although five did not start the study. A similar proportion from each treatment group dropped out along the course of the study. The researchers measured adherence to the study treatments by counting returned tablets. For the main analysis of brain shrinkage, the researchers used data on 168 people (85 receiving active treatment and 83 receiving placebo) who had completed an MRI at both the start and at follow-up. The analyses took into account a variety of factors that may be linked to brain atrophy or use of vitamin B, which the researchers had tested and found to be important. These factors were age, blood pressure, initial brain volume and concentration of homocysteine at the start of the study. Treatment with vitamin B tablets had notable effects on the levels of homocysteine in the blood, reducing it by 22.5 percent. Levels of homocysteine increased by 7.7 percent in the placebo group. Overall, treatment with B vitamins for a period of 24 months led to a reduction in the rate of brain atrophy. After the age of the participants was taken into account, the rate of shrinkage in people receiving the vitamins was 30 percent less than in the placebo group (0.76 percent shrinkage and 1.08 percent shrinkage respectively). The effect was greater in people who were more compliant with taking their medication and in those who started with the highest levels of homocysteine. The researchers also found that, overall, the safety of vitamins was good with no adverse events. The researchers concluded that they have shown that a “simple and safe treatment” can slow down the accelerated rate of brain atrophy in people with mild cognitive impairment. This is an important but early study in establishing the effects of vitamin B on the stages of brain atrophy that precede Alzheimer’s disease. It assessed the effects of the vitamin on the rate of brain shrinkage, a process that has been linked to old age, mild cognitive impairment and Alzheimer’s disease in other studies. Although other studies have found that the rate of brain atrophy is linked to cognitive decline, this particular study did not assess whether the participants’ brain changes translated into changes of cognitive ability or memory. This study will pave the way for future research into the use of vitamin B to prevent Alzheimer’s disease. Based on the evidence gathered so far, it is too early to claim that vitamin B can prevent clinical disease, but these results are promising. It is also interesting to note that this is a major study that exemplifies the use of potential biomarkers such as imaging, in therapeutic trials for MCI and AD.